Regular cream cheese is an acceptable ingredient in a Mexican dip recipe. An easy layered Mexican chili cheese dip starts with a layer of cream cheese spread in the bottom of a casserole dish. Chopped green chiles, canned chili and shredded cheese form the other layers. For a hot dip, the layers get baked in the oven at 350 degrees Fahrenheit for about 20 minutes, or covered and heated in the microwave for about three minutes. 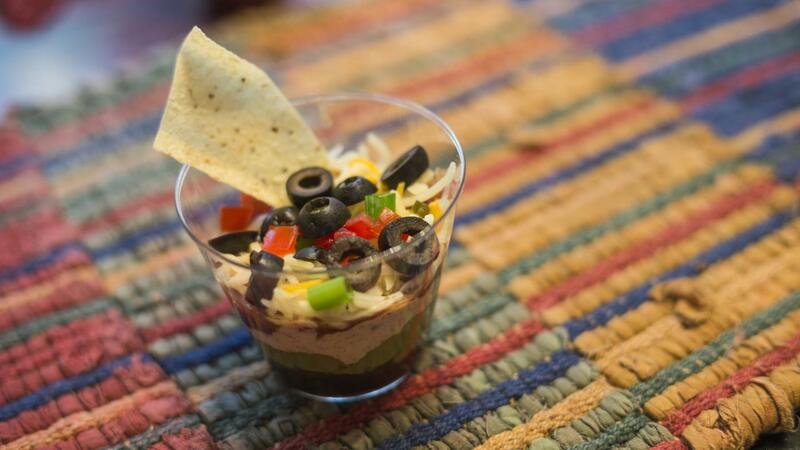 The dip tastes good with tortilla chips or bell pepper strips for dippers. Using jalapeños instead of green chili gives more heat for those who like their Mexican dips spicy. To make a vegetarian version of this cream cheese based dip, substitute salsa or a vegetarian chili for the standard canned chili. Sliced green onions or black olives are good additions for creating variations. Likewise, homemade chili or salsa provide a fresh alternative to jarred and canned varieties. In many dip recipes, cream cheese makes a suitable substitute for sour cream if it is softened in the microwave before using, or use half cream cheese and half sour cream for a more spreadable mixture. Low-fat and fat-free cream cheese substitutes are options for those watching their fat intake. What Is a Good Fruit Dip Recipe That Uses Yogurt and Cream Cheese? What Is a Simple Recipe for Jalapeño Cream Cheese Dip? Is Vegetable Shortening the Same As Vegetable Oil? How Long Does It Take to Bake Chicken? What Ingredients Are in the Waffle House Fully Loaded Hashbrowns? How Long Should Chicken Be Boiled for Safe Consumption? What Is a Recipe for a Cream Cheese Pinwheel? What Is a Recipe for Cream Cheese Wontons?